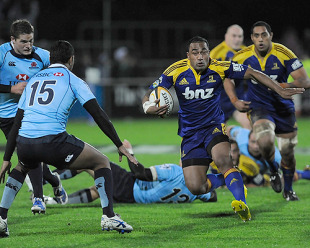 Connacht have announced the signing of Fetu'u Vainikolo from the Highlanders. The 26-year-old winger has penned a two-year contract with the province and will arrive in Ireland in time for the start of next season. "We're really looking forward to Fetu'u joining us," Connacht head coach Eric Elwood said. "He has shown he can score tries from anywhere on the pitch and we are excited to have a player of his skill and expertise joining the team. Having a player of his pace and physicality in the backs will add an extra dimension to our game." Meanwhile, Vainikolo, who was born in Tonga but moved to New Zealand when he was 12, believes that he will have little problem to adjusting to a different way of life and a different style of rugby. "I am excited about furthering my career with Connacht," he said. "I have watched their progress with interest this season and been impressed with their style of play. I am looking forward to hopefully scoring many tries in the green jersey."